Partly because birth-control pills are available only by prescription, people tend to think they’re more dangerous and less well understood than they actually are. In fact, “more is known about the safety of oral contraceptives than has been known about any other drug in the history of medicine,” declared an editorial in the American Journal of Public Health back in 1993. That editorial accompanied an article arguing for over-the-counter sales…. Nearly two decades later, birth-control pills look even safer than they did then, and recent research indicates that women are both able and eager to manage their own purchase decisions. ….Aside from safety, the biggest argument for keeping birth-control pills prescription-only is, to put it bluntly, extortion. The current arrangement forces women to go to the doctor at least once a year, usually submitting to a pelvic exam, if they want this extremely reliable form of contraception. That demand may suit doctors’ paternalist instincts and financial interests, but it doesn’t serve patients’ needs. It’s not just doctors who resist making oral contraceptives available over the counter. Pharmaceutical companies usually resist it too. After all, it costs them money for extra testing and produces lower profits at the same time, since OTC meds generally have lower margins than prescription meds. That’s a lot of resistance to overcome. But here’s an interesting thing. The El Paso study that Postrel writes about did indeed find that women who got their pills at a clinic were more likely to stop taking them than women who bought them over the counter. However, that was only for women who got monthly prescriptions. 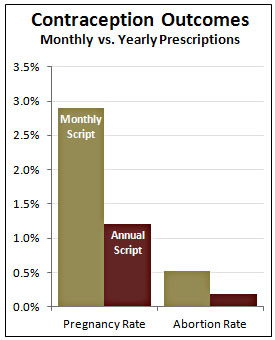 Women who got six-month supplies had discontinuation rates that were nearly identical to those who bought OTC pills. This gibes with another study done in California that compared continuous use of contraceptives among women who got monthly supplies vs. women who got yearly supplies. Over the following 15 months, the women who got yearly supplies were less likely to run out, less likely to get pregnant, and less likely to have an abortion. Making oral contraceptives available over the counter might be a good idea, but it’s not something likely to happen any time soon. In the meantime, though, providing women with annual supplies instead of making them visit a clinic or refill their scripts every month might have nearly the same benefit. This would require both doctors and insurance companies to change the way they do business, but given the safety of the drugs and the danger associated with running out, annual prescriptions probably ought to be the default.